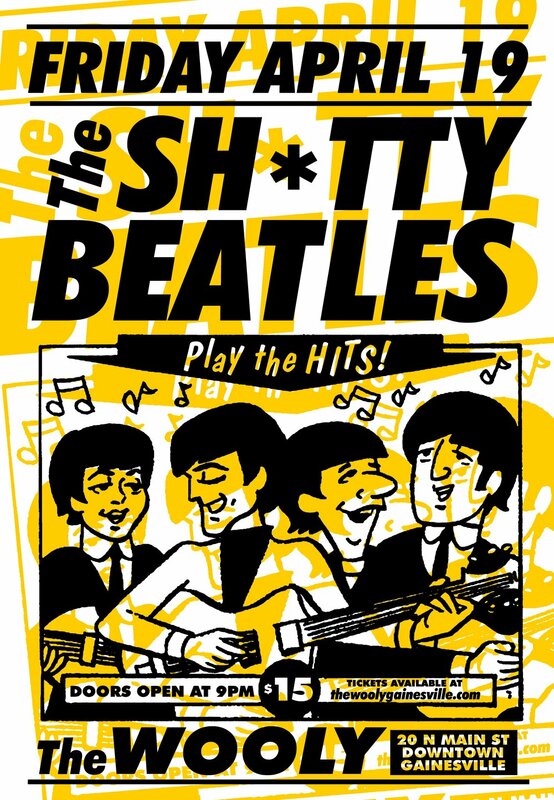 The Sh*tty Beatles return to The Wooly! $15 advance and at the door. Make sure and grab tickets as we expect another sold out show! 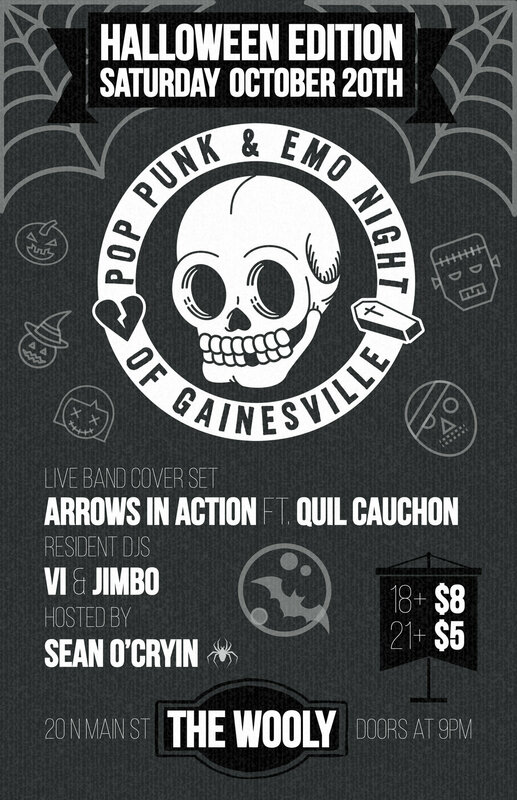 Tickets available locally at Arrow's Aim Records or online at The Wooly. 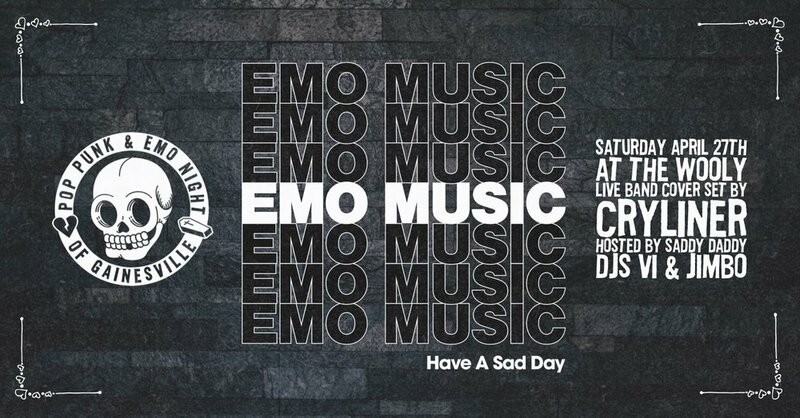 A dance party for fans of Paramore, Taking Back Sunday, Fall Out Boy, Say Anything, Thursday, The Used, Blink 182, My Chemical Romance, Jimmy Eat World, Panic! At the Disco, Motion City Soundtrack, The All-American Rejects, Green Day, Red Jumpsuit Apparatus, Hawthorne Heights, Dashboard Confessional and many more! Catch a glimpse of the whooping crane in this one-hour nature documentary. The documentary, directed by Greg Pope and Rhett Turner, follows efforts to save the rare, endangered bird through remarkable footage and interviews filmed over the span of two years. 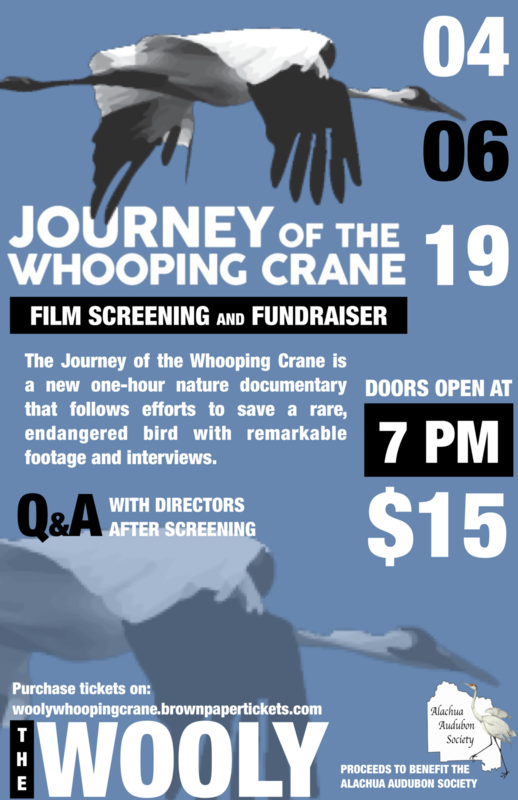 The directors will be holding a Q&A right after the screening to answer any and all questions regarding the journeys of the whooping crane and their film. Make sure to get your tickets through: https://woolywhoopingcrane.brownpapertickets.com or at the door for $15! Find your most outrageous outfits as we celebrate a British invasion for one night only! You won't be UNDER PRESSURE to enjoy the night with our signature cocktails, disco floor and photo opportunities! The Wooly cordially invites you to our first ever Queer Prom, a dance party for queer love by queer people. All are welcome here, baby! Even if you’re straight as the Centaur’s arrow, there’s a place at our party for you. Yesterday’s prom is over. Queer Prom is a ball for all! 1 night and 3 unique areas of lights, atmosphere and music. Save the date ⏤ Full info TBA. The two-day festival will take place at venues around the city's downtown such as Bo Diddley Plaza, The Hippodrome, High Dive, Wooly/Atlantic, Civic Media Center, Volta, & more. In an effort to relinquish any connection to former President Andrew Jackson and to avoid disrespecting Muslims, the former Andrew Jackson Jihad rebranded themselves to AJJ in 2016. “As the world changed, and as we changed as people, it just got more difficult to give a convincing answer for why our band was called that […] The act of striving to do better is a constant theme in our work, that’s where the name [change] was coming from,” frontman Sean Bonnette told AV Music. ImagineTwogether is an immersive arts, massage therapy, sound therapy, food, and music festival geared to raise money and awareness to rehabilitate victims of domestic violence, child abuse, and/or sexual assault as well as rescued animals. This is all done possible through K9C.A.R.E.S. Incorporated. ♥ Helping the community by funding K9 CARES Inc who take victims of domestic violence, sexual assault, and/or child abuse and guide them through the entire process of rescuing, rehabilitating, and training their own emotional support animal. K9CARES pays for the animals food, vet care, and vet bills for the duration of the animal’s entire life. Once the victims have trained their own emotional support animal, they are given the opportunity to join K9CARES and helping guide other victims through the process of training their emotional support animals. LOCATION: Depot Park’s BoxCar 201 SE Depot Avenue Gainesville, Fl 32601. Sa·vants of soul 1: Gainesville’s hottest source for soul music. Captive Eddies’ music is rooted firmly in conscious lyrics that are not afraid to face the darkness in order to bring light to every aspect of the human heart. Formed in September of 2014 and climbing steeply from the band’s initial goal of “playing at least one show,” energetic fans pushed the band to new heights in 2016 when Locochino performed at Okeechobee Music & Arts Festival, Suwannee Hulaween, Hometeam New Year’s Rally, Farm to Family Music Festival, and other multi-day music festivals in the southeastern United States. With new festival bookings continuing to reach more distant regions, Locochino shows no signs of slowing and continues to bring new flavor to each performance. Flint Blade creates live, uplifting soundscapes of voice, beatbox and the Chapman Stick two-handed tapping instrument. Drawing inspiration from dub reggae, jazz and electronica among all kinds of music, Flint’s penchant for improvisation manifests in subtle and extremely present performances of original material as well as unique renditions of familiar favorites. On stage, in the studio and through life, spirit guides an exploration of the ethereal nature of sound. Last year’s festival was named StrongerTwogether and you can expect a slight name change for each annual festival as it grows, though ‘Twogether’ will always be a part of the name. Why? It is derived from K9CARES Inc.’s motto – #StrongerTwogether. Aurora Healing Arts is Gainesville, Florida’s center for finding your center: your safe and sacred space. Allowing you to go deep into the body, mind, heart, and soul, through wisdom traditions, healing modalities and a cross-pollination of practices respected from around the world. The community has grown and now every event is filled with such good natured and open-hearted people. This is a place where there is “no one way” or “right way,” to find yourself, but rather a place where all rivers lead to the same ocean and there are many different kinds of opportunities to dive deep within and see what resonates with you. From yoga and meditation, to ecstatic dance and dance therapy, to communication workshops and women’s circles, and so much more, there is something for everyone. We laugh, we cry, we scream and shout… We speak, we listen, we dance about… Join us for holistic healing and good-natured, open-hearted fun, in whatever way calls to you. The place feels safe and sacred, the people are authentic, and we are ready and waiting for you. Eli Tragash was born and raised in Gainesville, Florida and has played the violin throughout his childhood. Eli began singing and playing guitar during his teenage years and became interested in American folk music. For the past 6-7 years, he has been performing a variety of folk music around Alachua County. Currently, he is a member of The Front Porch Backsteppers. Their members include Chuck Davis, Shawn Updegrave, John Peyton and Virginia Carr. They began playing music together on the front porch of Coffee ‘n Cream Cafe in beautiful downtown Micanopy, Florida and continue to play there most Saturday and Sunday afternoons. The Funky Miracle blesses their listeners by playing mostly instrumental music by the Meters, New Orleans Traditionals, and other famous instrumental music as well as improvisational jams featuring guitar, keys, bass, and drums. Gainesville’s Mostly Instrumental NOLA Funk & Meters Tribute Band. Ben has been playing electric guitar since the age of 9, originally influenced by the grunge guitar sound of the mid ’90s. He then fell in love with metal, and was a die-hard metalhead until discovering jam music during college. Now Ben plays in Headstash, a Gainesville jam band performing Phish and Grateful Dead tunes with its own character, style and flair. $15 all you can eat wing & nacho bar! cheap beer buckets! 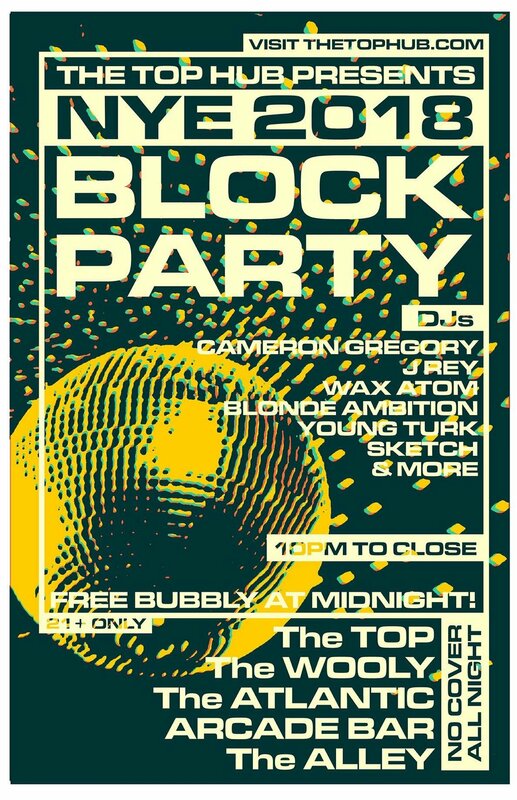 Enjoyed the 70s Saturday Night Fever theme at our NYE Block Party? Come back down to The Wooly for ONE NIGHT ONLY to catch the glamorous and exclusive Studio 54 nightclub revived in downtown Gainesville! Enter our best-dressed contest where the TOP TWO most glammed of the evening will be announced on stage at midnight! The bar will be open for all of your drinking needs as you disco dance the night away! flipturn is comprised of Dillon Basse (lead vocals/rhythm guitar), Tristan Duncan (lead guitar), Madeline Jarman (bass), Taylor Allen (synth), and Adrian Walker (drums). With a fun, feel-good sound that takes influence from artists such as Hippo Campus and Two Door Cinema Club, flipturn seamlessly blends elements of surf rock, garage, new wave, and pop. March 2017 saw the release of flipturn’s debut EP, "Heavy Colors", which was met with a wave of positive reviews from critics and fans alike. In the spring of 2018, flipturn released their critically-acclaimed sophomore EP, "Citrona". Pandora Music selected "Citrona" as one of their "Pandora Picks" for April 2018. "Citrona is a polished, dynamic display of raw emotion and pure talent that leaves you craving more" (S. Elkin, Pandora). So far, flipturn has gained over one million streams on Spotify. flipturn has performed throughout Florida and the east coast and has provided support for Magic City Hippies, Saint Motel, and COIN, among others. In March 2018, flipturn beat out 3,000 other bands to secure a spot on the main stage at Okeechobee Music Festival-- performing on the same stage as Arcade Fire, Halsey, and Snoop Dogg. To promote their newest EP, "Citrona", flipturn toured around the United States in May of 2018, playing for packed houses and sold out venues. flipturn's youthful energy and exciting stage presence translate into a captivated audience chanting, “One more song!” at the end of each show. ❥ Post your song requests in the discussion! The Lemon City is said to have gotten its name from a lemon grove. The band was inspired to name themselves after the neighborhood. At their recording studio, the trio created a new taste to the art of funk music. They honed their sound playing at local live music venues like Lagniappe House and Wynwood Yard. Over the years, the band's sound has evolved. Their new music has some rock vibes to their funk, which Robertson says is a “more of a geographical representation of the music scene in the city of Miami.” The band joined Sundial to talk about their start, their music and music venues around the city. Join us in in an epic celebration of the power of organizing by celebrating the 46th anniversary of the Roe V Wade decision with bands, DJs, local community groups, guerrilla theatre and a silent auction! Proceeds will benefit the organizing work of National Women's Liberation. Our right to reproductive justice has been consistently under attack ever since the Roe V Wade decision. Many believe it was solely this decision (via the Supreme Court) that gave us the right to abortion in the US when in reality it was the years of struggle and organizing and bold demands by ordinary people that won us the right to abortion. Enjoy great music, hear from other local groups fighting for justice, and bid on amazing silent auction prizes, all while financially supporting the movement! 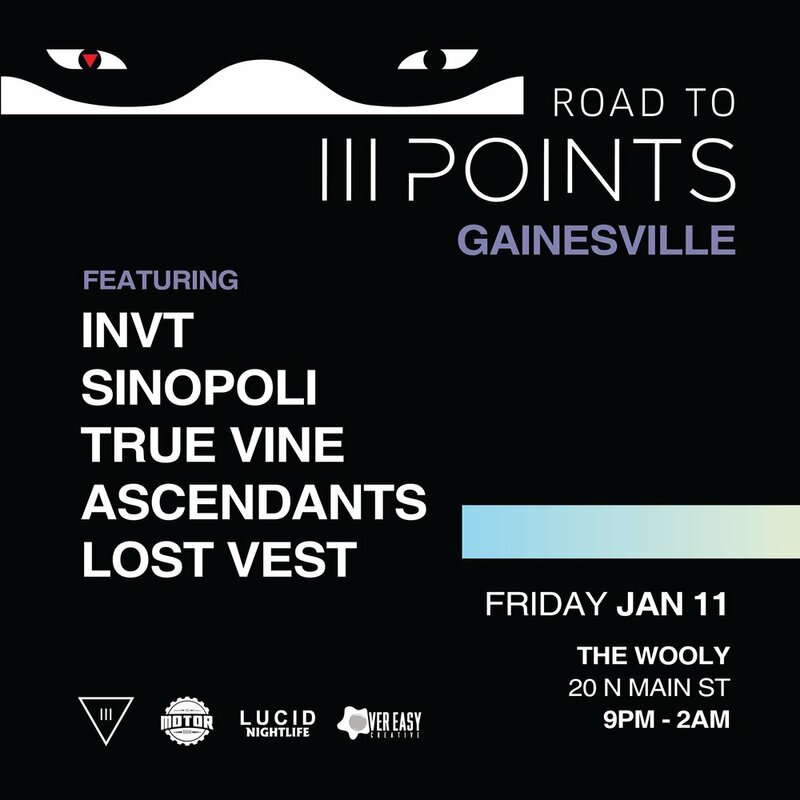 Join us as III Points Festival takes over Gainesville on Friday, January 11th. We'll be showcasing some of the homegrown talent featured on from the III Points festival lineup, as well as limited-edition merch and a chance to win some III Points Festival tickets! We invite you to come out and experience a taste of III Points before making your way down to Miami in February. Doors open at 9PM, end at 2AM. At the end of the night, we are raffling away tickets to III POINTS FESTIVAL! Featuring SZA, Tyler the Creator, A$AP Rocky, Erykah Badu, Beach house, Virtual Self and much more! Join us for an all out takeover of North Main Street on New Years Eve. 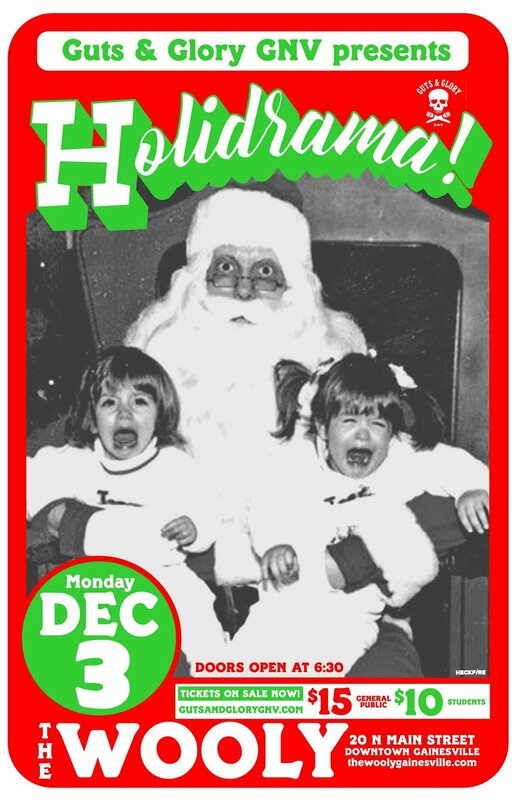 You are cordially invited to join us at The Wooly for drinking and dancing at our annual Holiday Party. $10 will be required at the door to be donated to our local food bank. Complimentary wells and select beer till midnight. See ya under the mistletoe! 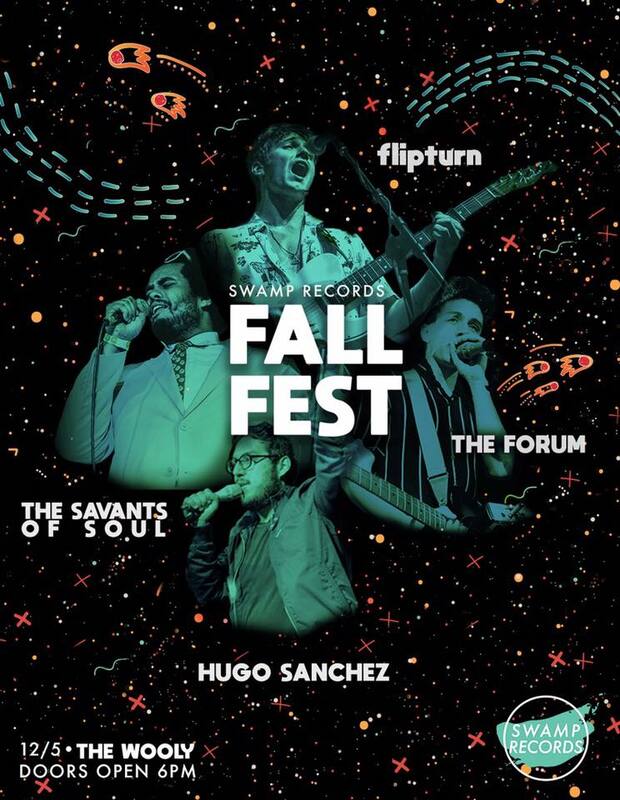 End your semester right with Swamp Records' Fall Fest! Join us for a night filled with live music, great food and good vibes! We promise it'll be fire, even if the weather is a little ice-y. Venmo "SwampRecords" $12 for presale tickets or $15 at the door (additional $3 if under 21). The event is 16+. Guts & Glory GNV is back to bring you a night of the holiday spirit from - uhhh, maybe a different angle. We've all got those strange holiday stories that involve gifts gone wrong, the black sheep of the family, or maybe the turkey that burned in the oven....again. 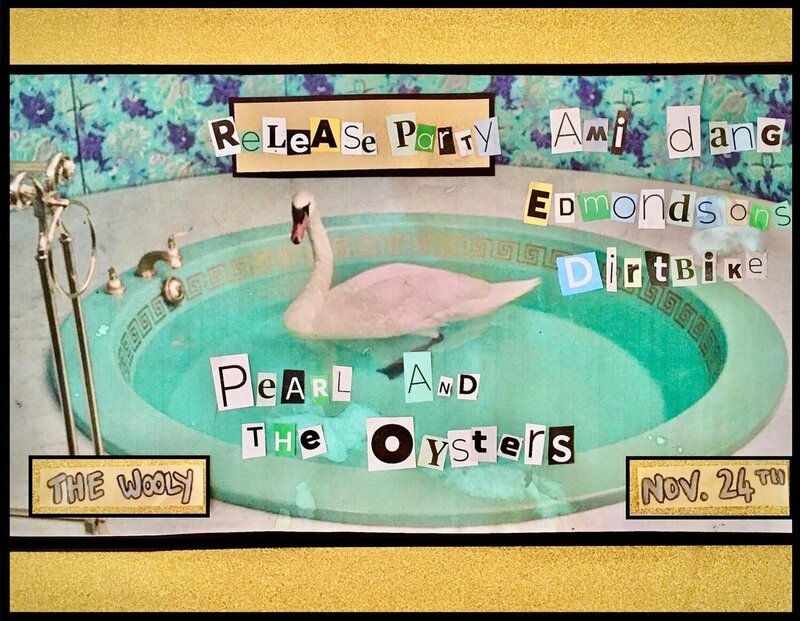 Tonight will be a celebration of those tinseled tales, and we'd love to have you along for the ride! 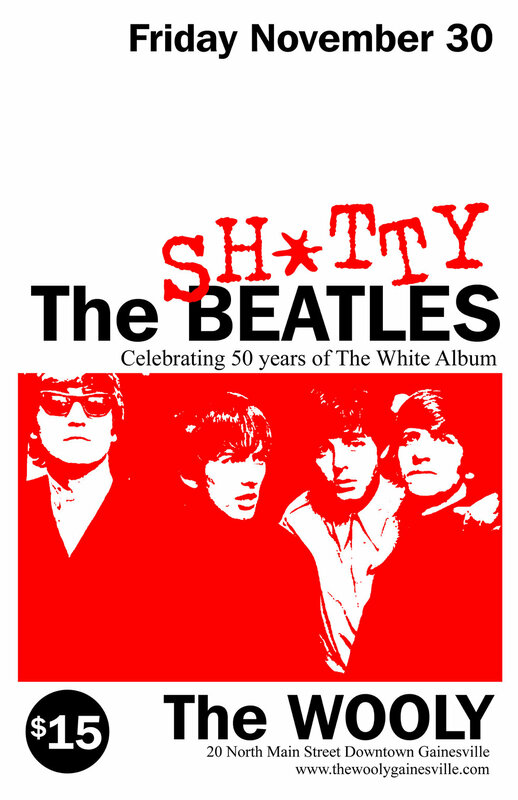 FRI 11.30 - The Sh*tty Beatles Live! $15 pre sale and at the door. as we expect another sold out show. Dress code: None BUT aquatic/sci-fi costumes are encouraged! Beloved cartoon classics from the 1960s through 1980s will now be at The Depot Event Space for YOUR KIDS (and you) to enjoy! Popeye, Betty Boop, Scooby-Doo and Ultraman, to name a few, will be showing for one hour as you unwind from your busy weekend! We are hoping to make this a monthly series! Be on the lookout for the next Sunday Morning Cartoons! The first set consists primarily of material from Chez Viking (2009) and New Myths (2016), followed by a second set featuring a performance of A Data Learn the Language in its entirety. Come watch handi-capable dogs and cats strut their stuff in the name of rescue. All proceeds will benefit Haile's Angels Pet Rescue’s Handi-Capable Angels Fund. This special fund helps us save the lives of the North Central Florida community’s differently-abled rescue animals. For fans of Paramore, Taking Back Sunday, Fall Out Boy, Say Anything, Thursday, The Used, Blink 182, My Chemical Romance, Jimmy Eat World, Panic At the Disco, Motion City Soundtrack, The All-American Rejects, Green Day, Red Jumpsuit Apparatus, Hawthorne Heights, Dashboard Confessional and many more! The biggest Halloween party of the year is getting even bigger! Radioactive horror events, Gator Sound and Lighting, Lucid Nightlife , and Contagious Concepts have teamed up to do one hell of a creepy event! The uniquely branded duo exploded onto the scene in September of 2016 with their debut release “Feel Your Love” via Skrillex’s imprint and media platform, Nest HQ. Receiving praise and support from Owsla, media outlets, and DJs alike. That EP evoked the initiation to PURGE’s genre-bending concept. They quickly grabbed the attention of listeners for exhibiting technical sounds and a haunting dark bass feeling in their music. Since then, they’ve gone on to receive over 1.5 million streams on Spotify, made their festival debuts at EDC Orlando and Okeechobee Music & Arts Festival and have had their tracks supported by Steve Aoki, DJ Snake, Marshmello, Rezz, Slander, Henry Fong, Krewella, and San Holo. The goal for PURGE aims to take a rebellious stance on electronic music by gathering their influences from genre-benders like Noisia, Skrillex and Flume for their creative attitude, which they aim to implement in their own concept. Their sets and mixes have been described as “intensely dynamic” with an extensively eclectic song selection throughout their sets. You can expect to feel every kind of emotion in their sets. Releases on Nest HQ / OWSLA, New Noise / Dim Mak, bitbird, Insomniac Records, Elysian Records, and Firepower Records. This dark and eerie atmosphere will be even more than that, with dubstep and house pumping beats and a radioactive circus as the haunted zone. . Better be weary about what lurks in the shadows. "Music From the Past and Today"
Who else is counting down the days till Halloween season? Wear your costumes to get in the Halloween spirit!